What Does TK Provide on an Advantage Series Climb? Climbers would usually expect to be collected from their hotel by their guide and support team at 0730 on the morning of their climb. Where there are climbers staying at different hotels this pick-up time may be deferred slightly. Climbers joining climbs on which there are other climbers staying at different hotels who wish to have an accurate estimate of their amended pick-up time are asked to either call or SMS our Arusha office. 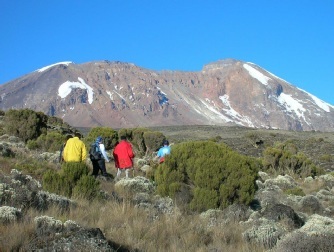 Following pick-up, transfer times will vary from 90 minutes-odd for Machame climbs, to some five hours (including lunch) if climbing from Rongai. Details of these transfers will however be provided in your route overview. Please feel free to request this at any time. On arrival at the gate you will be required to sign-in in the gate register. Your guide will however generally aim to obtain all your registry details on a separate document to enable hi to complete most register entries on your behalf. It is necessary to register at each camp, on arrival. If there are climbers under 16 years of age and who therefore qualify for a concessionary rate, these climbers are required to present their original passports at the gate in order to be admitted to the park. Copies of passports cannot be accepted by KINAPA in these circumstances; only originals will suffice. 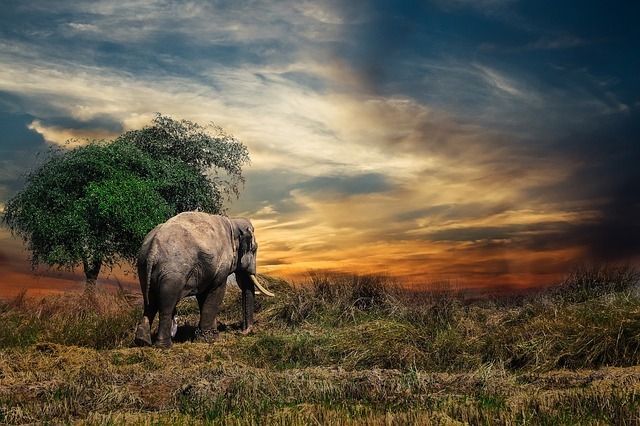 Our staff are drawn from throughout northern Tanzania and it is our genuine belief that we enjoy the loyalty of some of the profession’s most talented, diligent and committed guides and support staff. It is sometimes easy to forget all names and faces of your crew when there are many other climbing groups from other companies moving alongside your own team and so we encourage climbers on any evening that they should wish to assemble the staff together by rank and request introductions to be made, if there has not yet been an opportunity to do this or if the climbing party wishes to refresh their memories as to which staff are accompanying them. Climbers are not under pressure to rush themselves to meet stringent timings, however we do aim to be amongst the first (often we are the very first) to quit camp in the morning and begin the day’s trek. This is because a) this affords plenty of time for a slow and relaxed lunch in mess tents, which aids appetite and assists acclimatisation when combined with the lunch venue being the highest point of the day’s movements, and b) this ensures a smoother respiration curve from activity to sleep, which we have also found to aid acclimatisation, and c) arriving into camp early each day tends to ensure we get in ahead of the afternoon rains, and d) this allows time for a relaxed acclimatisation excursion in the afternoon on day’s where this is of benefit. Breakfast is usually porridge followed by eggs and toast, with additional toast with marmalade or jams. Climbers are asked to communicate with the guide as regards their appetites or we will tend to err on the side of caution in providing much more food than necessary. On nearly all days (except first and last days), the support team will be fragmented with strong runners in support of the cook pressing on ahead to erect the mess tent for lunch. We aim to have at least drinks and a soup dish ready by the time climbers reach the lunch point, and we generally manage to achieve this, even with the strongest climbing groups. A light pasta dish will generally follow. Lunch usually occurs under shelter so as to avoid the necessity to rush, and to provide warmth and protection from the wind and rain. However, if the weather is particularly clement we will sometimes dispense with the mess tent at lunch time and tables will be set up in the open air. Climbers are required to themselves supply the kit listed on our recommended personal kit checklist. Tunnel tents with large vestibules. We have made this decision in response to our having noticed that many climbers do not have much experience in administering themselves in a confined space, so while this new design has a much larger surface area to anchorage ratio and so is less storm-resistant, there is more circulated air under the tent’s outer and therefore less condensation forms, and climbers tend to enjoy the convenience of having plenty of space to stow their kit and do their morning and evening personal admin. We have not yet experienced any problems in storms with these tents, but please note that where we expect stormy weather and for some Excel Series climbs we may substitute this design for a more stable tent. Please also note that on our Lite Series climbs we will often use smaller, lighter tents, but manufactured to the same exacting standards. Mess tents for meals. 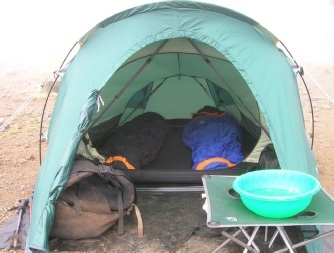 (On our Lite Series climbs we do not use mess tents). All necessary cutlery and ancillaries for meals and drinks. Custom-designed 4cm-thick foam sleeping mattresses. We find around 95% or so of our climbers who are asked or who volunteer their opinion, find these to be considerably more comfortable than Thermarests, or similar. On our Lite Series climbs we use Thermarests so as minimise weight. Wash basins for rudimentary personal ablutions. (Private portable toilets can be hired for USD 10 a day but are an inclusive feature on our Excel Series climbs). First Aid Kits complete with reactive drugs for the treatment of AMS. Expired Pressure Retention Masks for the treatment of pulmonary oedema. Our Gamow bags and defribrillators are not standard features of our climbs but can be hired by large groups and those defining themselves as ‘high risk’ climbers and who wish to equip themselves for extremely rare eventualities that disallow rapid evacuation from the crater. On the last day of your climb if you wish to get to Arusha early, you will need to have communicated this to your guide yesterday evening and to agree an earlier waking-up time. The final day of a climb will usually only require movement in the morning, with most groups reaching the gate at around 1100, but some slower groups arriving only at around 1300 or thereabouts. Climbers will be aware that it is customary to tip the mountain staff on this last day. The usual venue for this is at the gate at which we exit the park, however sometimes your guide will aim to elicit whether you are willing to arrange the presentation a little earlier, just before beginning the descent on the last day. This arrangement will usually be requested if a number of the porter team live in Moshi - as opposed to Arusha, where most of our staff live - as the guide will sometimes need time to calculate divisions of the total amount tipped and / or to send on a runner ahead of the support team to split large notes so that the porter team can divide at the gate and all staff can go home with their tips. These porters will then only return to TK’s office the following morning for post-climb duties and to collect their salaries. Ordinarily however, with the majority of our porter teams returning direct to Arusha, the normal venue at which to present tips is either Mweka Gate, for climbs on Lemosho, Machame, Shira or Umbwe, or Marangu Gate, for climbs on Rongai or Marangu. For further information on tipping please see here. If you are descending to Mweka Gate, please note that while you will likely see some groups being collected from right beside the gate, this is not a practice that we usually use, as a) the National Park Authorities prefer climb organisers to work with them in minimising congestion at the gate as there is only a single track dirt road accessing this point, and b) because there is only a single track road there are frequent problems with vehicles being delayed at the gate while vehicles en route to this point are extricating themselves from the mud on the steep approach to the gate. We therefore usually will walk the additional 15 minutes to be collected in Mweka Village. If you have noticed while climbing with the rest of your group over the previous few days that there is a significant difference in pace between some members of the group, we strongly recommend that you arrange with your guide that the party should fragment into at least two parts, each with its own assistant guide leading, before beginning the descent, otherwise the faster members may arrive at the gate an hour or two ahead of the slower members, and this would represent a poor use of the final hours of your time on Kilimanjaro. Far preferable would be for the faster members to have a relaxed morning start enjoying the last views of the peak while taking extra tea, while the slower members move on ahead, and for the faster members to stop frequently in the rain forest and ask their guide to try to find Colobus monkeys to photograph and to talk to them about some of the rare fauna that can be found in this final section. These measures should ensure that everyone finishes the descent at about the same time and no-one suffers any unnecessary waiting time before being transferred back to Arusha. While your guide will be liasing with our office via mobile phone to advise on your estimated arrival time to the gate, on rare occasions it is possible for you to arrive at the gate and not find our driver waiting for you. In 2006 we were once delayed reaching a gate by two hours because the vehicle being used by another climb organiser had broken down in very bad weather on a muddy section, and blocked the only access road and there was no way to pass this point until all vehicles had reversed out of the way and this vehicle been pushed out of the way. In all circumstances, we would simply ask you to remember that you are in a country in which the infrastructure is probably very inferior to your native country and that there are often far fewer options for tackling such eventualities. Where your driver has not arrived please remind your guide that we offer free alcoholic beverages at the village to take your mind off this delay! While arguably less preferable than getting to a meal and hot shower, you can also request your guide to show you around the village and see a little of how the locals live, if this is of interest to you and your pre- or post-climb activities do not already afford such insights. We punctuate the return to Arusha with a stop in Moshi to have lunch at the restaurant that we believe makes the best cheeseburgers in the area. Climbing for a week tends to promote such appetites, but if you are not partial to burgers other options will be available to you at this restaurant. Please be aware that while food and soft drinks are included in this meal, climbers are required to pay for their own alcoholic beverages, if they choose to have these. It is usual for only the lead guide, or sometimes the assistant guides also, to join in with this meal, but the rest of the support team will usually wait until they have been reunited with their families before taking their next meal. To this end we release all staff immediately on return to the office once all kit has been deposited, with staff only being required to report again to the office the following morning. Having finished lunch and completed the transfer, it is usual to return to your hotel sometime between 1400 and 1700, depending on what time you began this morning and how quickly you descended. Note that if you are required to fly out of Kilimanjaro International Airport the same day as you have descended, on an evening flight, this is possible, but you’ll need to have arranged earlier timings for today with your guide. 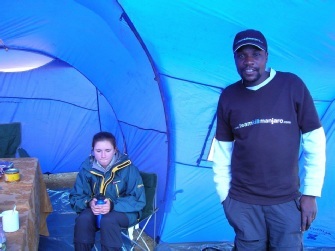 “The standard of food and accomodation was a lot better than we ever expected - "5* Star Kilimanjaro"
We are also often asked whether we are able to cater for vegetarians. We are, and we estimate that vegetarians comprise some 10% or so of all our climbers, so this is a very usual request. We do not operate set menus and conversely, our cooks are at liberty to prepare their own favourite choices of meals, which we find encourages flare and diversity. However, all of these choices sit within our guidelines which aim to balance carbohydrates and proteins, and to reduce fat content as we gain elevation (where digestion becomes harder). Some of our staff who have worked with other climb organisers before joining us claim that our food expenditure for a single climber is equivalent to what many companies will spend on 3 climbers, so the following list should not be considered to be representative of Kilimanjaro climbs generally. We do however aim to provide copious quantities of fresh fruits and vegetables and take all reasonable measures to promote appetite, as we find that nutrition is an essential ingredient of summit success. Thinking about what to do after your climb?